2 Senior Awards Night Thursday, May 9, 2019 All seniors receiving scholarships ($500 and up) will be recognized at Venice High School’s Senior Awards Night on Thursday, May 9, 2019, at 7:00 pm in the VPAC. This event allows students, parents, family members, and friends to celebrate the outstanding achievement of those seniors who have received scholarships and awards. TO BE INCLUDED IN SENIOR AWARDS NIGHT, STUDENTS NEEDED TO REPORT THEIR SCHOLARSHIPS & AWARDS TO ROTARY FUTURES A.S.A.P. Seniors who are being recognized at Senior Awards Night will receive an invitation May 1st - May 7th, and only students who receive an invitation will be recognized at the event. Due to time limitations, we will NOT be recognizing students receiving the Florida Bright Futures Scholarship. For more information, contact Rotary Futures 480-3178 or email Kim.Kindell@sarasotacountyschools.net. Community Service Summer is a WONDERFUL time to VOLUNTEER! Any student wishing to complete their volunteer hours for the Florida Bright Futures Scholarship MUST complete the ONLINE Sarasota County School District registration process and have the plan approved. Once approved, the student may print out a log sheet for each organization/activity. Complete registration instructions are available on the VHS website > School Resources > Community Service Hours Info. Also, students may go directly to www. SarasotaCountySchools.net, click on the “Parents & Students” menu at the top of the page, under “Other Items” follow the link “High School Community Service.” Remember, summer is a wonderful time to participate in community service. Volunteering helps students build their resume and obtain valuable experience for college essays and scholarship competitions. 24, 2019. The deadline to register will be around July 26, 2019. Register for the SAT at www.collegeboard.org. The ACT offers a July test day, July 13th (deadline June 14th). The first ACT of the 2019-20 school year will be on Saturday, September 14, 2019. The deadline to register is August 16th. Register for the ACT at www.act.org. Students who receive Free or Reduced Lunch are eligible for waivers of the test fees. Only juniors and seniors may use the waivers. Waivers are available in the Rotary Futures College Resource Center. 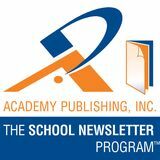 scholarships and institutional scholarship offers. In total, the Class of 2018 garnered over $8 million in scholarship dollars! PLEASE NOTE -- Due to the program configuration, the SSMS may NOT be used until Senior year. There will be plenty of time Senior year for the scholarship search! Open to area students of all ages, Rotary Futures is an invaluable and unique resource for VHS students and the Venice community! Rotary Futures College Resource Center SUMMER HOURS Rotary Futures will maintain normal operating hours through May 17th, and then we will have limited part-time summer hours. Our part-time SUMMER operating hours will be: May 20th – May 31st, Tuesdays and Thursdays, 9 am – 12 noon, Wednesdays, 9 am – 3 pm. We will be closed from June 1st – July 30th. We will reopen on July 31st, with the same part-time summer hours. When school starts on August 12th, we will resume our normal operating hours. Please check our website and Facebook page for summer updates. “Like” us on Facebook and follow us on Instagram to receive notices of our opening and valuable information all year long! Submitted by: Dr. Jackie Henson-Dacey Congratulations to Chelsy Gollen (9th grade) for having her digital painting, Lady Liberty, selected to represent Venice High School at the annual Congressional Student Art Competition. Her work will be on display at Ringling Museum at the end of the month. The winner from the 17th District will have their work on display at the U.S. Capitol. Winners will also receive airline tickets for two to travel to Washington, D.C., for the Congressional Art Competition Reception. Welcome Joshua Jacobson, Art Intern, to Venice High School. Josh will be working directly with Dr. Henson-Dacey for the remainder of the school year. Please come by and meet Josh as he delivers instruction, learns about formative and summative assessment, and builds positive relationships with the students. Josh also owns his own film business/ studio and has worked at Booker High School in the VPA Film program. He is eager to gain his credentials to start his employment as a full-time art teacher for 2019-2020 academic year. Students in the AP/IB program are actively engaged in preparing assessments for IBO and College Board. Portfolios are being assembled digitally, and then send out the top 5 (Quality) artworks for external review by examiners at the College Board. While working diligently on assessments, the students are studying the work of Kehinde Wiley. He is the contemporary artist who painted the portrait of Former President Barack Obama, which hangs in the Smithsonianâ&#x20AC;&#x2122;s National Portrait Gallery in Washington, D.C. Students are learning the historical, cultural, and societal characteristics of Wileyâ&#x20AC;&#x2122;s work. Wiley applies the visual vocabulary and conventions of glorification, history, and wealth and prestige to his subjects. His large scale, photo-realistic paintings are created with the use of urban fabric. The subjects and stylistic references for his paintings are juxtaposed inversions of each other, forcing ambiguity and provocative perplexity to pervade his imagery. Wiley blurs the boundaries between traditional and contemporary modes of representation and the critical portrayal of masculinity and physicality as it pertains to the view of African-American males. Thanks to a generous grant from the Education Foundation of Sarasota County, students in the IB/AP Studio Art class were able to design their own Batiks. Students studied the art of Java, Indonesia and Yoruba, Nigeria. After comparing specific batik techniques and styles, students worked with an artist-in-residence, Judy Lyons, who demonstrated a variety of techniques to help students explore the creative potential of this fabric art form. Learn more at EdExploreSRQ.com Funded by Sarasota County Schools, EdExploreSRQ is a web-based resource designed to help teachers, administrators and parents identify active learning opportunities for students. It has been another busy year for the Société Honoraire de Français (French Honor Society). In October, the Society inducted 16 new members, bringing our current membership to 74 in its 6th year. Sponsored by French teacher Lorri Glidden, the society is a national organization whose purpose is to “promote high standards of scholarship, to reward scholastic achievements, to create enthusiasm for and an understanding of francophone culture civilization, to promote and perpetuate international friendship, and to reward efforts toward furthering solidarity in the French-speaking world.” Throughout the year, we have conducted 4 community service projects that included a food drive in November to help restock our food pantry after the hurricane, Toys for Tots in December, a “Valentine for Vets” activity for our retired and disabled military service members in February, and in March we conducted a drive for animals at the Suncoast Humane Society. New officers were elected in March and will be serving the Society through the 2019-2020 school year. The officers are President, Lorett Alarcon, Vice-President, Danielle D’Angelo, Secretary, Jillian Alexander, Treasurer, Nicolette Kulcsar, Historian, Luwel Abarintos and Interclub Council Rep., Kelly Chen. This spring we will be graduating 14 seniors and we would like to thank them for their service and commitment and wish them well as they start a new chapter in their lives. They will certainly be missed! Information on eligibility requirements will be given to students in all French classes. For more information, please contact Lorri Glidden at the High School at extension 65658. Do you have any of those Christmas gifts/gift cards laying around that you will never use and can’t return? If so, we would be glad to take them off your hands. Each year VHS likes to be able to provide gifts in the form of gift cards or items to some of our less fortunate students. This year we were able to surprise several of our students with a Christmas gift. Our goal is to make it even bigger and better next year. So, we are starting early and asking for your help in hopes to reach our goal for next year. All donations can be dropped off at the VHS Attendance office in the front office. If you have any questions, feel free to call Christine Pomerleau 941-488-6726. Thank you for your continued support! Mr. Scott Biehler, Executive Director of the Mayors’ “Feed the Hungry” food drive, was a special guest at the February Interclub Council (ICC) meeting in order to accept a donation check from the group. Kileigh Rice’19, ICC’s President, presented Mr. Biehler with a check for $225 on behalf of ICC and VHS students, collected from loose change during lunchtimes. The Florida State Department of Education requires that school districts notify parents/guardians when their children are being instructed by a teacher who is “out-of-field.” “Out-of-field” is a term used for teachers who are assigned teaching duties in a class dealing with a subject matter that is outside the field in which the teacher is certified. The following teachers are teaching our-of-field in certain subject for 2018 - 2019 school year: •	James Bauman – Music K-12 •	Joshua Grant –ESOL (English for Speakers of Other Languages) •	Lauren Roberts – Art K-12 It is important to note that the district requires “out-of-field” teachers to actively pursue certification requirements. Just a friendly reminder that counselors follow the same calendar as teachers, so we will not be on campus over the summer. We look forward to working with all our students and families when we return in August. Please remember that if you are lacking credits needed for graduation, you can sign up to take courses over the summer on www.flvs.net. Please see your counselor if you have not registered, yet. This year the counselors presented the registration information in the VPAC. The registration PowerPoint is posted on the school website. Please remember to become familiar with the Bright Futures Requirements. The Bright Futures GPA is different from the Venice High GPA. Also, if you are pursuing the Gold Seal Scholarship you must have 3 consecutive classes within a certain CTE Pathway. For an explanation of this please see Mrs. Kindell in Rotary Futures or your guidance counselor. Search the Bright Futures Scholarship website to stay on top of the latest requirements for this state scholarship (www.MyFloridaEducation.com/brfuture). **Some courses do not meet Bright Futures requirements. Make sure that courses you select will qualify for Bright Futures. Please note that Liberal Arts Math does not meet the requirements for Bright Futures. Algebra 1A and Algebra 1B counts as one math credit for universities and Bright Futures. **To our athletes** NCAA has certain requirements for courses, gpa and test scores. NCAA will not accept APEX classes and certain academic classes. Please see your coach and/or counselor to make sure you have selected your academic classes correctly. We encourage all students to READ, READ, READ over the summer. The English Department will provide a summer reading list. Please do all you can to use your summer as an academic enrichment time. Summer is a wonderful time to make college visits. Create a list of post-secondary possibilities and explore them over the summer. Talk with your counselor and/or Mrs. Kindell in the Rotary Futures Portable about various options that will meet your needs. Volunteer in the community!! Get involved with a local event over the summer. This is a great way to enhance your resume, experience something new and to meet new people. Use the summer as a preparation time for ACT/SAT tests. Congratulations, to the senior class of 2019. We are so proud of all of you. The Guidance Department would like to wish everyone a relaxing summer. We look forward to working with you next year. You can purchase a brick for your student that will last a lifetime and forever be a part of history. The INDIAN WALK is the path that leads into the stadium. The seniors will walk across the path as they enter into the stadium for graduation. •	Brick size is 4”x8”-$100 (15 characters per line, 3 lines) If you are interested in purchasing a brick at the entrance to the football stadium, please go to veniceindianfootball.org for the form or send an email to vhsindianwalk@ gmail.com for more information. VHS Dress Code Guide 2018-2019 School Year HOODS Hoods are NOT to be worn in the building. This article is designed to address common questions and misconceptions about the dress code at Venice High School. Administrators, teachers, and students worked together to establish a dress code that strikes a balance of what is considered reasonable and appropriate for a school setting. We appreciate your support of the dress expectations that have been established and hope that this handout is helpful. Get real results—from higher scores on the ACT and SAT, to standout college application essays, to greater success in advanced courses. Call today to schedule a FREE SAT/ACT practice test with complimentary score analysis. Senior Class Mandatory Meeting Seniors will receive an Exit Ticket. The ticket must be completed and submitted at the class meeting on May 6th to pick up a cap/gown. Senior Class Mandatory Meeting - Cap & Gown Distribution Senior Exit Ticket must be completed to pick up cap/gown. If you have not ordered your cap and gown, go to www.Jostens.com by April 29th to order. Late fees apply. Senior Awards presented by Rotary Futures Senior Finals Baccalaureate Ceremony at Epiphany Cathedral at 7pm The Baccalaureate Ceremony is a non-denominational student led blessing of the graduating class. All seniors are invited to the ceremony. Please wear cap, gown, and tassel. Friends and family are invited to attend. Senior Grad Walk at Garden El, Venice El and Taylor Ranch @ 9am. Optional activity. If you choose to participate, wear cap/gown and arrive at one of the schools listed above by 8:45am. All seniors are welcome. Previous attendance at selected Elementary School is not required. Graduation rehearsal at 8:45am. Check in at the new gym (outside entrance). Graduation rehearsal is a requirement for participation in the Graduation Ceremony. Students participating in an IB or AP exam at the time of rehearsal will report to the football field after the exam. In order for the ceremony to flow smoothly, it is necessary for every student to be aware of the expectations that will be explained at practice. Commencement will begin at 8 p.m. Gate open for guests at 6:30 p.m. Seniors must report to the new gym no later than 6:30 p.m. wearing cap and gown. Enter through Heritage Hall (front entrance from front loop) Seniors park at Venice Elementary. Guests park at Venice High. Handicapped parking will be available on campus. Arrive early. No admission tickets are needed for the Class of 2019 Graduation Ceremony. There will be general seating in the football stadium. Ramps are available to access the stadium seating. It is appropriate for men to wear dress slacks and shirt w/collar (optional tie) under their gowns and women to wear a medium length skirt, dress, or dress pants. Informal wear (flip-flops, tennis shoes, boysâ&#x20AC;&#x2122; sandals, t-shirts, shorts, jeans, etc.) is inappropriate for our ceremony. The tassel starts on the right side of the mortarboard and is moved to the left side when directed by the Principal after the presentation of the diplomas. Write your name on the inside of your cap. Do NOT decorate your cap. Earned cords (Medals, NHS, and Mu Alpha Theta, etc.) may be worn during the ceremony. PRE-REGISTER FOR YOUR GRADUATION CEREMONY PHOTOS AND GET 20% OFF. Receive a coupon for 20% your entire order when you pre-register before graduation day. Visit the address below for details. www.gradimages.com/Preregistration The Class of 2019 and VHS staff request that members of the audience dress appropriately and observe all rules of courtesy. Smoking is prohibited on school grounds. Air horns and other noisemakers are prohibited on the premises. Objects of any sort are not to be thrown during the ceremony. Only the jacket/covers to the diplomas will be handed out during the graduation ceremony. Project Graduation will take place on graduation night, Friday, May 17 from 10 p.m. - 4 a.m. at the Venice YMCA. It is an all-night party celebrating the class of 2019. There will be food, music, fun, entertainment and friends. The event is designed to be a fun, safe, drug and alcohol-free party for VHS graduating seniors to keep them safe on one of the most important nights of their lives. This event has been a tradition for Venice High School for 31 years! The support of the Venice area community is the reason for the success of the program. Donations of food, prize items, gift cards and other items are currently being collected for the event. If you are able to provide a donation for Project Graduation please contact us. With your support we will make it the best event yet! Volunteers are also needed to help coordinate and staff the event. Help is needed from parents with students in all grade levels - not just parents of seniors! There are volunteer opportunities leading up to and during the Project Graduation event. We can find a spot that fits your schedule. Please contact the Project Graduation Planning Committee regarding donations or to volunteer, venicehighprojectgraduation@gmail.com. 10 Sixteen students traveled to Orlando, FL (March 22-25) for the annual FBLA State Conference. These students competed in various business-related events. At the First General Session, Kileigh Rice (President) was awarded a pin for her participation in the Business Achievement Award (BAA). This was an honor given to only a select few. Michael Bielanski accepted an award given for our participation in the March of Dimes. At the Awards session, Amanda Barrett, Jacob Gentle, and Riley Holmes placed 5th in Business Plan event. During their trip, students had an opportunity to network, attend workshops, and experience a professional conference. Mrs. Vanore and I are very proud of the many accomplishments our students had this year! Way to go Venice FBLA! 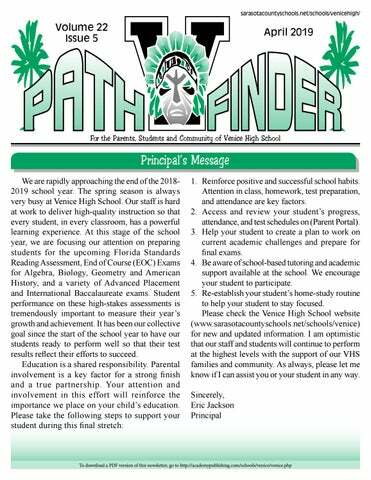 We are asking all VHS families to please confirm your child’s address and contact phone numbers we have documented in our Student Information System. This can be done by logging into the Parent or Student Portal. Click the Miscellaneous icon on the left blue side and select Contacts. Your home address will appear at the top under student details. If the information is not correct please provide a utility bill, or lease / purchase agreement with your name and new address. This can be dropped off, emailed, or faxed. We must have one of these three items in order to make the necessary changes. If there is a new phone number(s), these can be hand written. Please include who the number belongs to and the type, i.e. cell, home, work, etc. Please direct emails to Debra.Colombo@sarasotacountyschools.net or fax (941) 486-2034. Thank you for your assistance in this matter. If your child does NOT graduate, you can request a refund for the cap and gown package. A request should be emailed directly to Nicole.Wolfe@ sarasotacountyschools.net by May 17th. A check will be issued within 2-3 weeks of your request. Refunds are NOT available for other events/items. YOU’RE INVITED TO TRAVEL WITH US!!! ENROLL TODAY!! Hi families! I hope you can join Mr. Debacco, Mrs. Donofrio, Mrs. Schmucker and myself to learn more about the student trips we are leading with EF Educational Tours in 2020. Here’s what we’ll cover during the meeting: ● Where and when we’re going ● What we’ll see and do ● Travel logistics ● How your child can earn academic credit ● Flexible payment options that keep the trip affordable I’ll also share details about how to sign up (space is limited!) and answer any questions you might have. Thank you to Moricz Orthodontics for treating our VHS staff to ice cream. Very much appreciated!! !